Outdoor lighting is vital not only to the safety and security of your family and property, but also to the aesthetic and functional success of your landscape. However, the best outdoor lighting techniques for you will vary depending on a few key factors—mainly the layout of your landscape, the hardscapes you have, and your stylistic preferences. Fortunately, the experts at O’Grady’s Landscape can help you make a well-informed decision and implement it for you to maximize its success! Uplighting – we use uplighting to direct light upwards towards your trees, illuminating their natural beauty. Backlighting – an artistic outdoor lighting technique, backlighting involves placing lights behind an object or at an angle to create the perception of added depth. Moonlighting – another way to bring out the natural beauty within your landscape, moonlighting involves angling lights so that they shine down through the branches of your trees, creating shadows for added beauty throughout your property. Other accent lighting – we can design your lights to emphasize your home or certain portions of your landscape using accent lighting techniques that vary based on the scope of your landscape. Task lighting – we can use outdoor lighting techniques for functionality purposes, illuminating your cooking space and lighting up your walkways for increased safety on dark evenings. Keep in mind that the locations where you’re having lights installed will make an impact on the styles you’ll want to use. Our landscapers can help you select the best techniques to use for your pathway lights, as well as your garden, patio, and front landing lighting designs. We use only the highest quality fixtures to implement outdoor lighting techniques, including low voltage systems and LED lights. These types of systems use less energy, reducing your monthly energy bills, last longer, and are environmentally friendly. 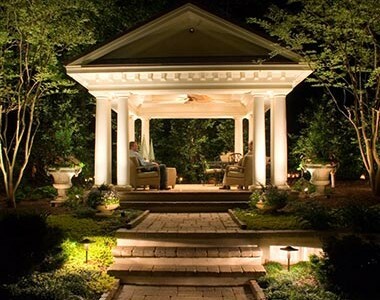 O’Grady’s Landscape implements the above outdoor lighting techniques in landscapes throughout Northern Virginia—including Great Falls, City of Falls Church, McLean, Vienna, and North Arlington. Whether you need to update your existing design with LED lights or you want to install added outdoor lighting to illuminate your trees and keep your pathways secure, our skilled and experienced landscapers are here to help. Let us help you add the finishing touches to your outdoor space! 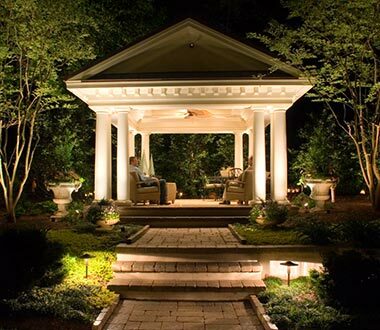 Contact us to get a free estimate on your Northern Virginia outdoor lighting project today.